The 2030 Agenda for Sustainable Development is a plan of action for people, planet, and prosperity. UN DESA recognizes that eradicating poverty in all its forms and dimensions, including extreme poverty, is the greatest global challenge and an indispensable requirement for sustainable development. 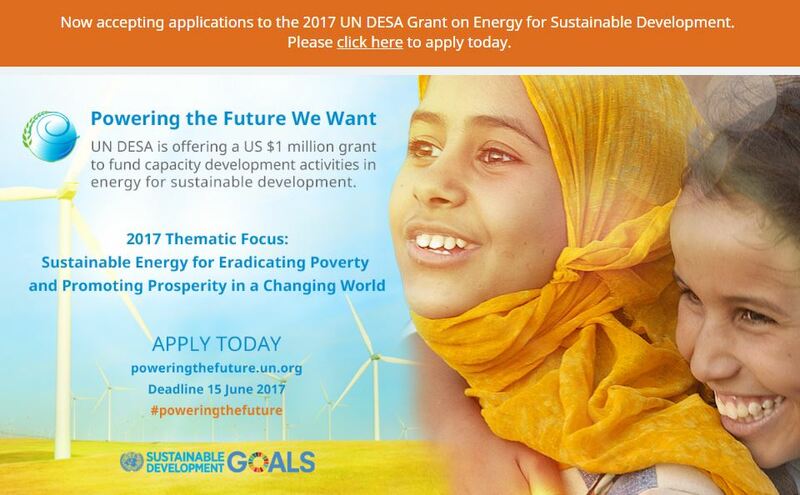 The thematic focus for the 2017 UN DESA Energy Grant is “Sustainable Energy for Eradicating Poverty and Promoting Prosperity in a Changing World,” reflecting the multiple roles that energy plays in the eradication of poverty through advancements in health, education, water supply, industrialization and combating climate change. Powering the Future We Want offers a grant for one million US dollars to fund future capacity development activities in energy for sustainable development. The Grant is awarded to an individual, institution or partnership based on past and current achievements.